The word "shotefin" is used in the Mishnah almost always to denote joint owners, especially of land. 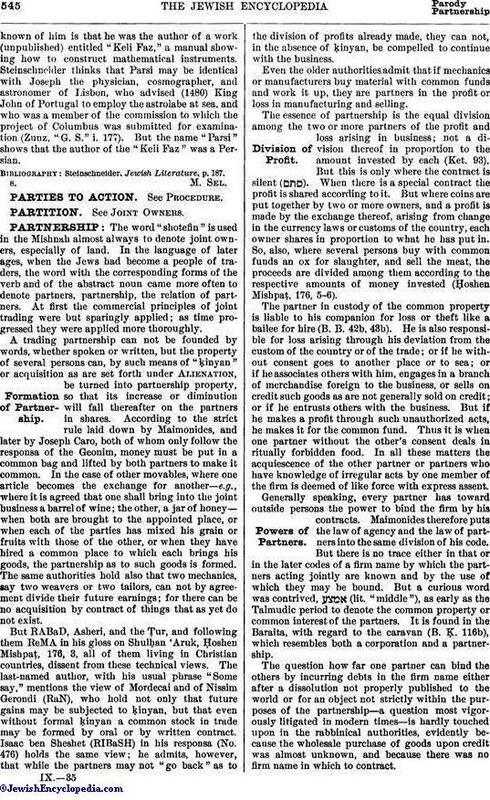 In the language of later ages, when the Jews had become a people of traders, the word with the corresponding forms of the verb and of the abstract noun came more often to denote partners, partnership, the relation of partners. At first the commercial principles of joint trading were but sparingly applied; as time progressed they were applied more thoroughly. A trading partnership can not be founded by words, whether spoken or written, but the property of several persons can, by such means of "ḳinyan" or acquisition as are set forth under Alienation, be turned into partnership property, so that its increase or diminution will fall thereafter on the partners in shares. According to the strict rule laid down by Maimonides, and later by Joseph Caro, both of whom only follow the responsa of the Geonim, money must be put in a common bag and lifted by both partners to make it common. In the case of other movables, where one article becomes the exchange for another—e.g., where it is agreed that one shall bring into the joint business a barrel of wine; the other, a jar of honey—when both are brought to the appointed place, or when each of the parties has mixed his grain or fruits with those of the other, or when they have hired a common place to which each brings his goods, the partnership as to such goods is formed. The same authorities hold also that two mechanics, say two weavers or two tailors, can not by agreement divide their future earnings; for there can be no acquisition by contract of things that as yet do not exist. But RABaD, Asheri, and the Ṭur, and following them ReMA in his gloss on Shulḥan 'Aruk, Ḥoshen Mishpaṭ, 176, 3, all of them living in Christian countries, dissent from these technical views. The last-named author, with his usual phrase "Some say," mentions the view of Mordecai and of Nissim Gerondi (RaN), who hold not only that future gains may be subjected to ḳinyan, but that even without formal ḳinyan a common stock in trade may be formed by oral or by written contract. Isaac ben Sheshet (RIBaSH) in his responsa (No. 476) holds the same view; he admits, however, that while the partners may not "go back" as to the division of profits already made, they can not, in the absence of ḳinyan, be compelled to continue with the business. Even the older authorities admit that if mechanics or manufacturers buy material with common funds and work it up, they are partners in the profit or loss in manufacturing and selling. The essence of partnership is the equal division among the two or more partners of the profit and loss arising in business; not a division thereof in proportion to the amount invested by each (Ket. 93). But this is only where the contract is silent ( ). When there is a special contract the profit is shared according to it. But where coins are put together by two or more owners, and a profit is made by the exchange thereof, arising from change in the currency laws or customs of the country, each owner shares in proportion to what he has put in. So, also, where several persons buy with common funds an ox for slaughter, and sell the meat, the proceeds are divided among them according to the respective amounts of money invested (Ḥoshen Mishpaṭ, 176, 5-6). The partner in custody of the common property is liable to his companion for loss or theft like a bailee for hire (B. B. 42b, 43b). He is also responsible for loss arising through his deviation from the custom of the country or of the trade; or if he without consent goes to another place or to sea; or if he associates others with him, engages in a branch of merchandise foreign to the business, or sells on credit such goods as are not generally sold on credit; or if he entrusts others with the business. But if he makes a profit through such unauthorized acts, he makes it for the common fund. Thus it is when one partner without the other's consent deals in ritually forbidden food. In all these matters the acquiescence of the other partner or partners who have knowledge of irregular acts by one member of the firm is deemed of like force with express assent. Generally speaking, every partner has toward outside persons the power to bind the firm by his contracts. Maimonides therefore puts the law of agency and the law of partners into the same division of his code. But there is no trace either in that or in the later codes of a firm name by which the partners acting jointly are known and by the use of which they may be bound. But a curious word was contrived, (lit. "middle"), as early as the Talmudic period to denote the common property or common interest of the partners. It is found in the Baraita, with regard to the caravan (B. Ḳ. 116b), which resembles both a corporation and a partnership. 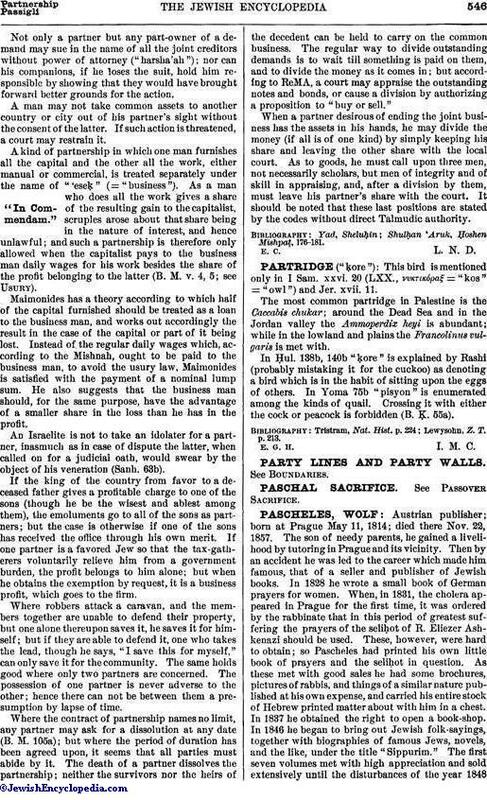 The question how far one partner can bind the others by incurring debts in the firm name either after a dissolution not properly published to the world or for an object not strictly within the purposes of the partnership—a question most vigorously litigated in modern times—is hardly touched upon in the rabbinical authorities, evidently because the wholesale purchase of goods upon credit was almost unknown, and because there was no firm name in which to contract. Not only a partner but any part-owner of a demente may sue in the name of all the joint creditors without power of attorney ("harsha'ah"); nor can his companions, if he loses the suit, hold him responsible by showing that they would have brought forward better grounds for the action. A man may not take common assets to another country or city out of his partner's sight without the consent of the latter. If such action is threatened, a court may restrain it. A kind of partnership in which one man furnishes all the capital and the other all the work, either manual or commercial, is treated separately under the name of "'eseḳ" (= "business"). As a man who does all the work gives a share of the resulting gain to the capitalist, scruples arose about that share being in the nature of interest, and hence unlawful; and such a partnership is therefore only allowed when the capitalist pays to the business man daily wages for his work besides the share of the profit belonging to the latter (B. M. v. 4, 5; see Usury). Maimonides has a theory according to which half of the capital furnished should be treated as a loan to the business man, and works out accordingly the result in the case of the capital or part of it being lost. Instead of the regular daily wages which, according to the Mishnah, ought to be paid to the business man, to avoid the usury law, Maimonides is satisfied with the payment of a nominal lump sum. He also suggests that the business man should, for the same purpose, have the advantage of a smaller share in the loss than he has in the profit. An Israelite is not to take an idolater for a partner, inasmuch as in case of dispute the latter, when called on for a judicial oath, would swear by the object of his veneration (Sanh. 63b). If the king of the country from favor to a deceased father gives a profitable charge to one of the sons (though he be the wisest and ablest among them), the emoluments go to all of the sons as partners; but the case is otherwise if one of the sons has received the office through his own merit. If one partner is a favored Jew so that the tax-gatherers voluntarily relieve him from a government burden, the profit belongs to him alone; but when he obtains the exemption by request, it is a business profit, which goes to the firm. Where robbers attack a caravan, and the members together are unable to defend their property, but one alone thereupon saves it, he saves it for himself; but if they are able to defend it, one who takes the lead, though he says, "I save this for myself," can only save it for the community. The same holds good where only two partners are concerned. The possession of one partner is never adverse to the other; hence there can not be between them a presumption by lapse of time. Where the contract of partnership names no limit, any partner may ask for a dissolution at any date (B. M. 105a); but where the period of duration has been agreed upon, it seems that all parties must abide by it. The death of a partner dissolves the partnership; neither the survivors nor the heirs of the decedent can be held to carry on the common business. The regular way to divide outstanding demands is to wait till something is paid on them, and to divide the money as it comes in; but according to ReMA, a court may appraise the outstanding notes and bonds, or cause a division by authorizing a proposition to "buy or sell." When a partner desirous of ending the joint business has the assets in his hands, he may divide the money (if all is of one kind) by simply keeping his share and leaving the other share with the local court. As to goods, he must call upon three men, not necessarily scholars, but men of integrity and of skill in appraising, and, after a division by them, must leave his partner's share with the court. It should be noted that these last positions are stated by the codes without direct Talmudic authority. Shulḥan 'Aruk, Ḥoshen Mishpaṭ, 176-181.